Muir Beach is the southernmost beach in Marin County, above the Marin Headlands. It's 3 miles west of Muir Woods in the town of Muir Beach, just off CA Highway 1. Muir beach is a pretty beach, smaller and more intimate than nearby Stinson Beach. It's small and can get crowded on hot days. What is There to Do at Muir Beach? Some visitors like to take a hike at Muir Beach. there's a 1.7-mile trail that starts after you cross the bridge and takes you to a scenic overlook. You may want to avoid it if you are afraid of heights, though. You can have bonfires in provided fire rings on the beach near the south end of the parking lot, but you'll have to bring your own wood. The number of rings available varies by season. Fires are allowed beginning at 9:00 a.m., but they must be out and everyone should be off the beach an hour after sunset. Swimming is not advised because of dangerous currents. No lifeguards are on duty. The Redwood Creek marsh nearby is a nice change from the sand. If you go there, you'll find lots of shorebirds, amphibians, salmon and trout, and marshy, water-loving rush plants. In the winter, monarch butterflies sometimes cluster on Monterey pine trees at Muir Beach. You may see their orange and black wings in the trees or see them flying away in the morning as the day warms up. You'll find a picnic area with charcoal grills near the parking lot, but it doesn't have a view of the beach. More picnic tables are located at nearby Muir Beach Overlook, which is beautiful but often so windblown you may worry that your meal will fly away. You can also get something to eat or drink at the Pelican Inn, which you will pass on your way in. There is no entrance fee and no parking fee, but the lot can fill up on busy days. Part of Muir Beach is a popular clothing-optional beach. It's on the north end past the big rocks. After a few years of low water quality ratings, Muir Beach is now off the state's list of unhealthy beaches. In case you're concerned about current conditions, you can check the Heal the Bay website. The sand can get hot underfoot in the summer, which will make you glad that you brought your flip flops. No glass bottles are allowed on the beach. Bring your drinks in plastic or bring something to transfer beverages into when you get there. If you need more information than this summary provides, try the Muir Beach website. Muir isn't the only beach in Marin County. 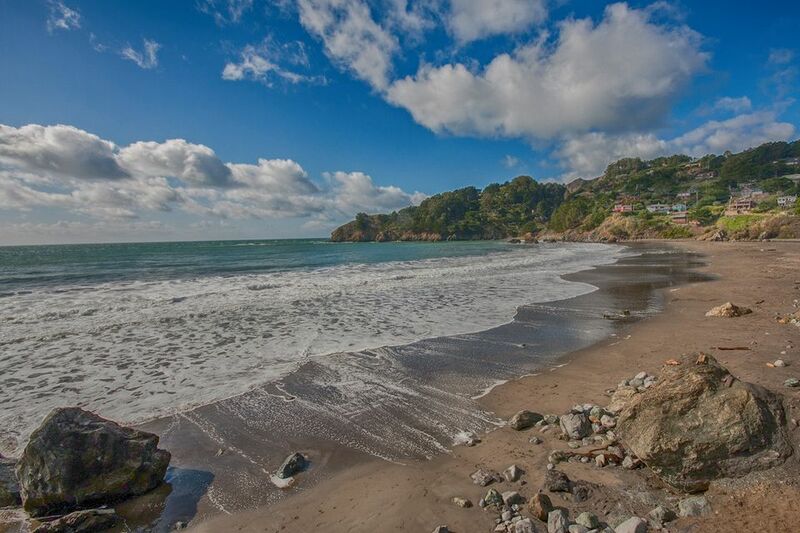 To find one that's just right for you, check the guide to Marin County's best beaches. You can also find some clothing optional beaches in Marin County. Turn left onto Pacific Way at milepost 5.7, just south of the Pelican Inn. If you don't know how to navigate using mile markers, here's how. There's a parking lot at the end of the road, but if it's full, don't try to park on Pacific Way. You're likely to end up with a costly parking ticket if you try it. Instead, go back out to the main road and park beside it or on the street about 100 yards north.